LIVE VIDEO: Trump Speaks At National Prayer Breakfast - Joe.My.God. 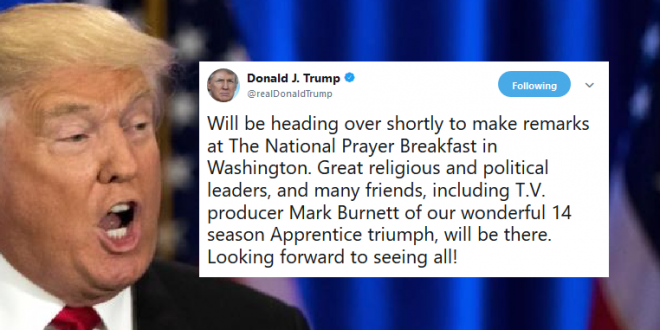 President Donald Trump will attend the National Prayer Breakfast Thursday, a prime networking opportunity for Beltway insiders. But this year’s event is also an opportunity for dozens of Russians. As many as 60 representatives from Russia’s religious and political elite are expected to attend, more than three times last year’s number, according to Russian officials. The spike in the number of Russians attending the event compared to last year comes amid multiple ongoing investigations into possible collusion between the Trump campaign and Russia as well as continued fallout from Russian interference in the 2016 election. Besides all those Russians, every major anti-LGBT hate group will be in the room.